It's not your classic Philly-style cheesesteak sandwich. It is, however, a quick and easy version—you could be biting into it in just 15 minutes! Cook vegetables in small nonstick skillet on medium heat 5 min., stirring occasionally. Add meat; cook and stir 3 min. or until heated through. Spoon meat mixture into center of skillet; top with Singles. Remove skillet from heat. Let stand 2 min. or until Singles is melted. Spread cut sides of roll with dressing; fill with meat mixture. For extra flavor, brush cut sides of roll with garlic butter. Broil until golden brown, then spread with dressing and fill as directed. Substitute OSCAR MAYER Deli Fresh Bold Cajun Style Turkey Breast for the Roast Beef. 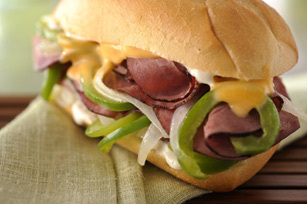 For added flavor, top sandwich with a quick cheesy sauce. Cut 1 oz. VELVEETA® into 1/2-inch cubes; place in small microwaveable bowl. Add 2 tsp. milk and a dash of dry mustard. Microwave on HIGH 30 sec. to 1 min. or until VELVEETA is completely melted and sauce is well blended when stirred.